After significant debate and discussion over a period of several months, the St. Paul City Council approved a new wage ordinance this week that will require a $15 minimum wage within the city of St. Paul for covered nonexempt workers. The City Council voted unanimously in favor of the wage change and St. Paul Mayor Melvin Carter signed it into law soon after. Similar to the Minneapolis $15 minimum wage ordinance, the St. Paul ordinance will phase in the $15 minimum wage increase over time, and the wage requirement will apply to all time worked within the city by a covered employee. All covered employers will have new minimum wage requirements by 2020, but the rate of phased-in increases will depend on the employer’s size. The ordinance distinguishes between “macro,” “large,” “small,” and “micro” businesses based on their number of employees, with different applicable phase-in requirements. Under the ordinance, an employer’s business size is based on the average number of employees it had per week during the previous calendar year. For brand new businesses, the size will be based on the average number of employees per week during the first 90 days after the first person begins working for the business. In addition, in determining an employer’s size, all employees on a full-time, part-time, joint, or temporary basis must be counted whether or not located in St. Paul. The ordinance provides that the city of St. Paul and “macro” employers must increase hourly wages to $12.50 effective January 1, 2020, and later increase hourly wages to $15 per hour effective July 1, 2022. “Macro businesses” include employers with 10,000 or more employees. Under the ordinance, “large businesses” include employers with more than 100 employees, and such businesses will be required to pay covered employees $15 per hour by July 1, 2023. “Small businesses,” defined as employers with 100 or fewer employees, must reach the $15 per hour rate by July 1, 2025. Finally, “micro businesses,” defined as employers with five employees or less, must meet the $15 hourly wage rate by July 1, 2027. 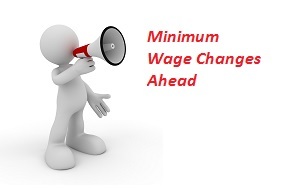 Additional wage schedule details for each type of business can be found in the ordinance. Comparatively, Minnesota’s 2019 statewide minimum wage, which is adjusted for inflation, will be $9.86 per hour for employees at large companies and just over $8.04 per hour for smaller companies. That being said, the new Minnesota governor-elect, Tim Walz, has indicated his support for exploring a statewide $15 minimum wage. There are some exceptions in the ordinance that permit lower minimum wage rates for youth training and apprenticeship programs, young workers at small employers, and players on an independent baseball team, paid pursuant to a negotiated contract. Like the Minneapolis ordinance and Minnesota state law, the St. Paul ordinance does not include a “tip credit” that would allow employers to count tips toward the minimum hourly wage. Notably, the St. Paul ordinance’s coverage of employees is extremely broad. The ordinance purports to cover workers based in and outside the city’s geographic boundaries. With respect to employees based outside of St. Paul, but who occasionally perform work in St. Paul, the ordinance states that they are covered if, over the course of one week, the employee performs “at least two hours of work for an employer within the geographic boundaries of the city.” An extraterritorial provision in the Minneapolis safe and sick ordinance was struck down as an overreach of that city’s police powers, so it is likely that there may be legal challenges to the extraterritorial application of the St. Paul wage ordinance. For now, though, employers will want to review their employee rosters to determine potentially covered employees and prepare to update their pay practices as needed to comply with the new law.